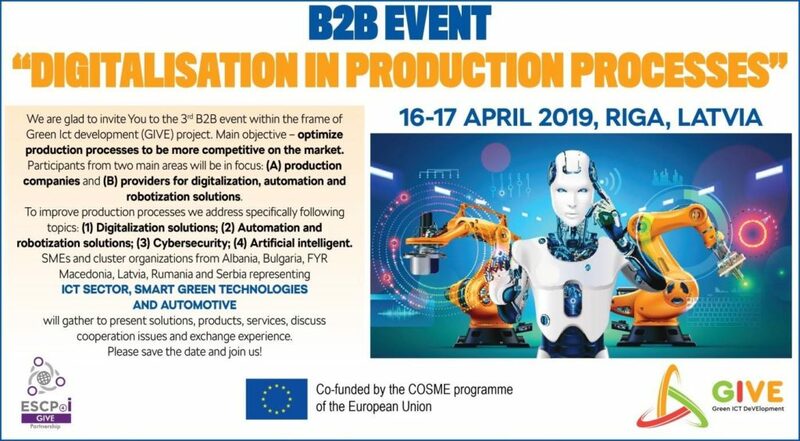 After the first two successful B2B events within the Green ICT Development (GIVE) project held in Skopje, North Macedonia on 12-13 December 2018 and Tirana, Albania on 21-22 February 2019, we are pleased to announce and invite you to attend the 3rd B2B event dedicated to “Digitalization in Production Processes” which will be held in Riga, Latvia on 16-17 April 2019. Event will bring together production companies and solution providers for digitalization, automation and robotization solutions. Main objective – optimize production processes to be more competitive on the market. If you will have some specific interest for additional business meetings during these days in Latvia, it will be our pleasure to assist You to establish needed contacts. The event will be 2 (two) days and it will be attended by SME representatives, cluster managers and organizations coming mainly from the sectors like Smart Green Technologies, Automotive and ICT sector. The event will be organized by Green and Smart Technology Cluster (Green-Tech Cluster) from Latvia and will have a regional character where companies coming from the three sectors, are part of the following countries: Albania, Bulgaria, Latvia, Romania, Macedonia, Romania, and Serbia. B2B event in the framework of Green Ict deVElopment (GIVE) project.